Efficient water management is not only a good thing but is vital to increasing the world’s food supply to feed the population of the future. Irrigation Australia’s highly successful International Conference and Exhibition, held in June at the International Convention Centre in Sydney, brought people together from different countries to engage in discussion on ways to better manage water for sustainable food production, using less water to produce higher yields. Dr Julian Cribb, Principal, Julian Cribb & Associates, set the scene for the conference in the opening plenary session by addressing the core issue The Age of Food: Feeding the World in the Era of ‘Peak People’. Dr Cribb explored the opportunities for courageous farmers into the future. Using the historical connection between food security and world peace, he noted the world currently spends 25 times more on armaments than on food. He estimated that Australia’s entire fossil fuel demands could be met from crops grown on a property the size of a large Australian sheep and cattle station. Cribb also raised the prospect of publicly funding food-water industries, reflecting that farmers receive no public financial support to achieve best environmental outcomes. Felix Reinders, President of ICID, followed with his presentation, The Role of ICID in the Irrigation Industry, contributing his significant worldwide understanding of the current irrigation industry. Reinders demonstrated the need to develop a much higher area of irrigated crops to keep pace with world population growth and shared how one of the world’s biggest tomato producers was producing 12 tons of tomatoes per hectare but is now producing 300 tons per hectare using LESS water. 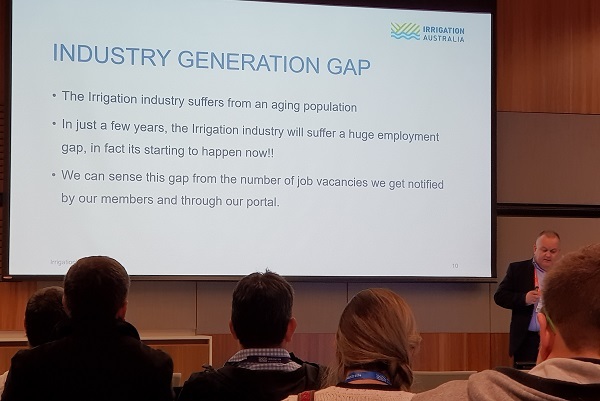 ICE WaRM shares an understanding with Irrigation Australia of the importance of training to drive better, smarter irrigation as well as secure the future of a diminishing workforce. 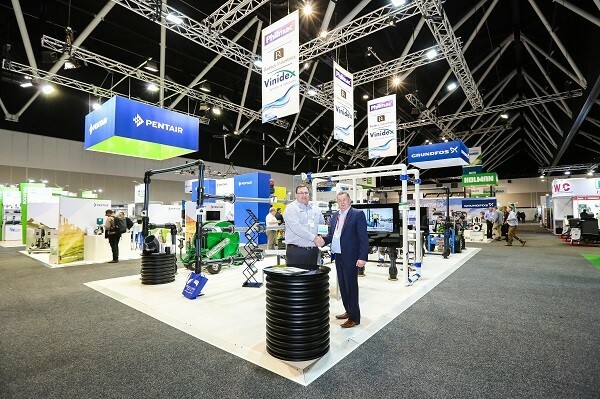 In a session led by Irrigation Australia’s Geoff Harvey, National Training, Certification and Marketing Manager, Training Towards a Sustainable Irrigation Future, Harvey emphasised the urgency to enhance the knowledge and capabilities of irrigators. “If we are to achieve water and food security in the future, we need to firstly ensure that we have enough educated staff to be able to fulfil this requirement especially in the irrigation market”, says Harvey. He proposed that Australia needs a crucial shift in irrigator demographics, from older to younger, if we are to achieve innovative, higher efficiencies, especially regarding better water management. This issue is even more important considering over half of Australia’s agricultural profits come from irrigated agriculture. ICE WaRM is working with Irrigation Australia to produce a webinar discussion on this topic, so stay in touch for registration details by visiting our website or subscribing to our newsletter.